This isn't going to be about the transition from winter to Winfly to mainbody seasons. It is going to be about the transitions from Ross Island to sea ice. We use two roads to take vehicles off the land and on to the sea ice. The first one at Scott Base is usable all year. 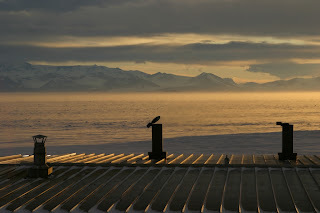 The second one at McMurdo, the VXE-6 transition, can only be used before the ice melts. A tidal crack at Cape Evans. The sea ice naturally freezes each year. After that happens, fleet operations uses heavy machinery to make the surface suitable for driving wheeled and tracked vehicles. Unfortunately, tidal forces are always effecting the sea ice which causes tidal cracks to form. 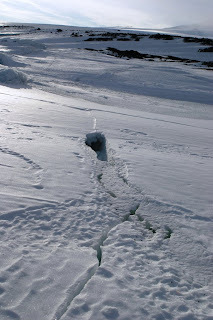 In the warmer parts of the summer, melting and pock marks caused by uneven melting weaken the sea ice. It is like the Pennsylvania Turnpike, always in need of repair. The danger of tidal cracks. To strengthen the sea ice, we spray down the transition with thousands of gallons of fresh water which seals cracks and smoothes the existing ice. We use fresh water because the impurities in the sea water make for weaker bonds. An estimated one millions gallons of water is required to build a stable transition from land to sea and even then big cracks are likely to form. For the sake of comparison, in one week where we were building the transition we used 325,000 gallons (about 403 gal/person). In Winfly three times as many people and weren't building the transition, we only used 26,000 gallons (83 gal/person). My preferred type of transition. After eight days of delays, the first flight of mainbody finally made it in yesterday afternoon. It took out 28 very happy winterovers. The flight for 7am this morning was twenty-five minutes away before it boomeranged, giving its passengers an extra four hours in the plane. The second afternoon flight didn't even take off which has left a few more winterovers wishing they were somewhere else.